What to Look for in the Best Garment Bag? What is the Best Way to Use a Garment Bag? What are the Negatives of Using a Garment Bag? What are the Prerequisites for Using a Garment Bag? Like we said, there are so many garment bags on the market that it is hard to know where to start. The first step of choosing your garment bag is to set yourself a budget. Prices range from $50 way up to $350 so there is a wide range for you to choose from. A high price tag doesn't always guarantee you the best quality rather a popular brand name so me sure to read reviews and talk to your friends about their choices. Second is style, what style of bag will you choose? Many garment bags come in plain black and look very business like; there are, however, many bags that push these boundaries and look far more fashionable, perfect for if you want to turn heads when you travel! The advantages of a garment bag are three-fold. Firstly, garment bags always fit into the carry-on luggage bins on air craft as as such can help you reduce your costs when travelling as there is no need to book in a hold bag. Secondly, a garment bag will often have wheels which makes your ease of movement when travelling significantly easier and more convenient. Thirdly, garment bags are very versatile; you can use them when travelling on business or for pleasure. The true advantage of a garment bag is that they are build to last. They are build to withstand heavy travel sessions; being lugged from taxi to airport, from airport onto the metro and back again. Unlike some bag choices the garment bag is truly designed with your travel needs in mind. There are a few criteria that your garment bag should meet before you invest your hard earned cash. Always, always, check the quality of the zips. The biggest problem with travel bags is that the zips do not live up to the standard set by the rest of the bag and as a result of a faulty zip you can end up having to dispose of a perfectly good bag. Wheels is another aspect to think about. Some garment bags do not have wheels and you should think about whether or not you need wheels to assist you in your travel. If you do opt for wheels make sure that you test out their ‘rollability’ to make sure that they don’t clunk and glide smoothly. The best way to use a garment bag is quite simply, when travelling! A garment bag is the best travel companion when on the road. Garment bags are best used when travelling short haul and for short amounts of time. As the garment bag only carries a limited amount of items and often you are redistricted to 7Kg when travelling on any airline the garment bag is best for a shorter travel experience. There are very few negatives about using a garment bag. They are lightweight and compact making travel as easy as possible. One stark negative about garment bags is that the majority of them are not that fashionable in their appearance. Many of them look very formal and uniform and as such do not make the fashion statement that many would wish to make when travelling. If you’re not bothered about appearance your how you are perceived then the garment bag is a great choice for you! The key prerequisite for using a garment bag is that you are travelling. A garment bag is a little big and bulky to be used on the daily commute to the office. 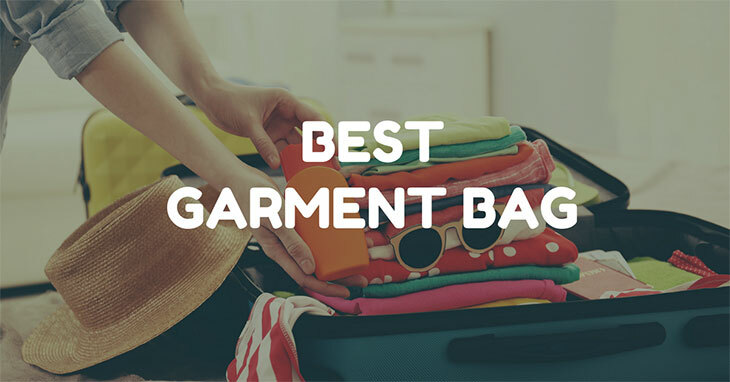 The second prerequisite is that you are travelling on an airplane for the majority of the garment bags on the market have been specifically designed to fit in your allocated cabin bag space in the overhead locker of the aircraft. The Travelpro Crew 10 Carry-On Rolling Garment Bag is on of the leading and most pioneering garment bags on the market. The Travelpro Crew 10 Carry-On Rolling Garment Bag takes the traditional form of a garment bag as it has two small wheels on the base for ease of travel. This Garment Bag is short in stature but the designers have added in a retractable gun-metal handle that makes walking with the Travelpro Crew 10 Carry-On Rolling Garment Bag very easy indeed. It is a classic looking garment bag designed and manufactured using black 100% nylon material. This nylon material is also the construct for the inner lining. The Travelpro Crew 10 Carry-On Rolling Garment bag is 14 inches in height and perfectly fits in the cabin bag allowance trays at all airports around the world. The Travelpro Crew 10 Carry-On Rolling Garment Bag has zippers to close and secure the bag and the little holes in the zipper pulls allow you to add a small padlock onto the bag should you desire that extra little security measure. The Travelpro Crew 10 Carry-On Rolling Garment Bag is a first choice bag with airline cabin crew staff and as such you know that this is a bag on which you can rely. The bag has a very formal and business like appearance making it perfect for business travel or high end leisure travel too. Wheels come out of sync after prolong use. The Briggs & Riley Baseline Domestic Carry-On Upright Garment Bag is the most superior and luxurious of all the garment bags on the market. This garment bag is head and shoulders above the rest and sadly there is a price tag to match! This garment bag comes in at a hefty $499 but if you want the best then money is no object. The Briggs & Riley Baseline Domestic Carry-On Upright Garment Bag is bigger than the Travelpro Crew 10 Carry-On Rolling Garment for it is 53cm in height and has a brilliant 43.6 litre capacity meaning that it will carry everything you need for your trip and a little more to help! The Briggs & Riley Baseline Domestic Carry-On Upright Garment Bag as the name suggests is a compatible size for all airlines carry on baggage allowance. The bag also comes with a lifetime warranty that keeps you safe from any damages caused to the bag by your airline. The Briggs & Riley Baseline Domestic Carry-On Upright Garment Bag has a strong zipper closing system that will keep your belongings safe and secure. The bag is 100% inside and out so there is minimal chance of damage occurring to the construction fabric. The Briggs & Riley Baseline Domestic Carry-On Upright Garment Bag has a sleek black design that is timeless and fashionable. This bag is perfect for a business trip to a week long conference for example or for a long romantic weekend getaway in Europe. Wherever you take the Briggs & Riley Baseline Domestic Carry-On Upright Garment Bag it’ll be your best bag yet! The Samsonite Luggage Lift Carry On Wheeled Garment Bag is a brilliant middle of the road garment bag. Priced at a fairly reasonable $169.99 the Samsonite Luggage Lift Carry On Wheeled Garment Bag is a firm favourite amongst business travellers and airline staff alike. The Samsonite Luggage Lift Carry On Wheeled Garment Bag is made with 100% nylon material which is standard for garment bags as it is lightweight and durable, not to mention easy to clean too. This bag comes in a jet black colour that is not only stylish but also hides the dirt and grim that it will enviably incur when on the road. The Samsonite Luggage Lift Carry On Wheeled Garment Bag, like the Travelpro Crew 10 Carry-On Rolling Garment is 14’’ in height. This bag too has a handy and convenient retractable handle that means you can utilise the bag’s wheel system to its optimum. The retractable hands is ultra-lightweight and is made of a strong alloy material. The Samsonite Luggage Lift Carry On Wheeled Garment Bag claims to have unbreakable zippers that interlock with kissing zipper heads. This kind of zipper system is bespoke to the Samsonite Luggage Lift Carry On Wheeled Garment Bag and is a big redeeming feature. The added security of this zipper and zipper puller system is second to none. There have been complaints, however, that the internal zippers are not as strong as the external zippers and as such when these break the Samsonite Luggage Lift Carry On Wheeled Garment Bag is rendered useless. As ever, treat the bag right and it will treat you right too! The A. Saks Deluxe Expandable Tri -Fold Carry-On Garment Bag is one of the most reasonably priced garment bags on the market. Coming in at a very fair $103 the A. Saks Deluxe Expandable Tri -Fold Carry-On Garment Bag is cheap and cheerful but still super brilliant. The A. Saks Deluxe Expandable Tri -Fold Carry-On Garment Bag as the name would suggest has a trifold system. The A. Saks Deluxe Expandable Tri -Fold Carry-On Garment Bag also has a Wally rack for hanging your suits and garments as well as a handy detachable shoulder strap to again make your travel experience as easy and convenient as possible. The A. Saks Deluxe Expandable Tri -Fold Carry-On Garment Bag is made with ballistic nylon and comes in a sleek, jet black colour. The handles of this garment bag feature a yellow stripe that adds to the durable and builder-like aesthetic of the design. The A. Saks Deluxe Expandable Tri -Fold Carry-On Garment Bag has multiple zipper pocket that allow you to stow away undergarments, your used clothes ready for laundry and your toiletries too. This A. Saks Deluxe Expandable Tri -Fold Carry-On Garment Bag has a lightweight construction and has a dual purpose slip-through back pocket that allows this garment back to slip over a trolley suitcase. The bag has adjustable clips that mean the bag can expand to give you more room for packing and storing your belongings. Cheap material that feels like it could break. The Waxed Canvas Garment Weekender Bag is the most fashionable looking of all our 2017 garment bags top picks. The Waxed Canvas Garment Weekender Bag has a stylish canvas material construction with a dusty grey colouring. The Waxed Canvas Garment Weekender Bag has zippers to close the bag and secure your belongings inside. The bag also meets the international baggage allowance standard for all international airlines. The Waxed Canvas Garment Weekender Bag is perfect for leisure travel and makes for the perfect accessory for any savvy traveller. The Waxed Canvas Garment Weekender Bag has four internal pockets that are designed for stowing away your accessories and smaller items. At the rear of the bag you will find a pocket that has been designed for thin laptops and tablet computers. Our firm winner of the best garment bag of 2017 is the Briggs & Riley Baseline Domestic Carry-On Upright Garment Bag. The Briggs & Riley Baseline Domestic Carry-On Upright Garment Bag is the best quality for the best price. Not only with great design features that help with your ease of travel but also has strong zippers that add to your peace of mind and security when you travel.